I had been in Havre covering the annual convention of the Montana Tavern Association and was having breakfast with Paul Tash of Butte, publisher of the association’s publication, Tavern Times. Though I had completed my last interviews and taken my last photo, Paul jokingly suggested I could stay for just one more meeting. No. I had that other appointment, though I wondered whether the grouse had gotten the memo. My destination for my hunt was a tract of public land on a high prairie ridge separating the Marias and Teton Rivers on one side and the Missouri River on the other. It’s an area rich in history. In June 1805 the Lewis & Clark expedition paused to stop and figure out which stream was the true Missouri. Off in the distance is a kiosk on top of a hill marking the point where Meriwether Lewis stopped, after an eight-mile walk before breakfast, to look over the countryside and decide which way to go, finally deciding on the south fork. Over succeeding years the area had an early trading post, one of the first railroad lines and an infamous battle in 1870 in which American soldiers attacked a band of Piegans huddled in winter camp along the Marias. 173 Indians, mostly women and children, were killed in the pre-dawn attack still remembered as the Marias Massacre. Over the years, countless steamboats, keelboats and smaller craft passed through the area to and from Fort Benton, head of navigation on the Missouri. These days it’s a popular launching area for floating the Missouri River. For several years we had taken annual trips here to hunt sharp-tailed grouse. The last time was in September 2001, just a few days after the terrorist attacks on the 11th. Looking back in my journals I’m reminded that the only grouse I saw were a few that flushed wild. I never fired a shot and the most memorable part of the trip was the silence in the skies, with all civilian air travel suspended. 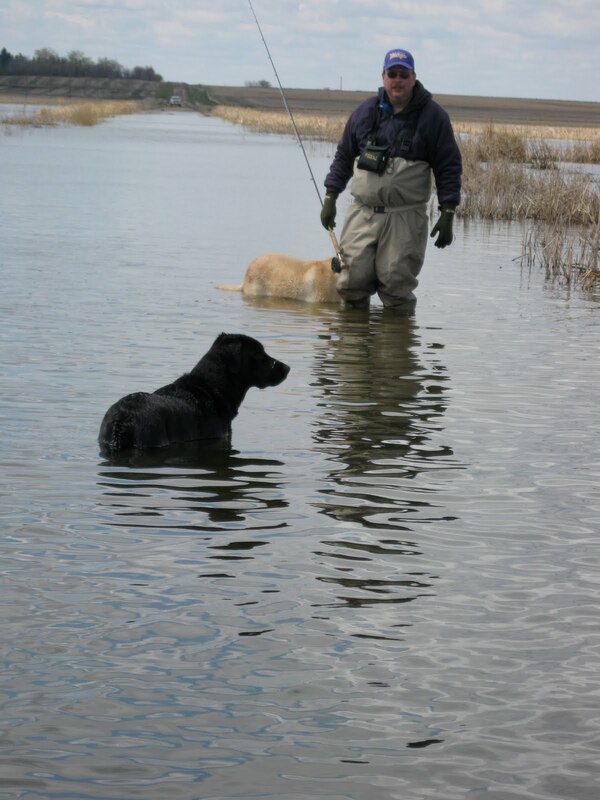 That was nine years and one dog ago, though the difficult part of this day’s hunt was that Flicka, my faithful Labrador retriever, was home in Butte. If there were sharptails on this prairie, would I find them without the help of a dog’s nose? The only guarantee, when you set off on a walk across the prairie, is that you’ll have a nice long walk and plenty of time to think, especially when not keeping track of a bird dog. I’m struck by the abundant wildflowers, particularly black-eyed Susans, blooming in the grassland. At a series of long, brushy draws connecting the benchland prairie with the river bottoms, mule deer pop out of their beds in the brush patches. The mulies, some five in all, look fat and sassy after a summer of easy living. One of the deer sports an impressive spread of antlers. By now, my saunter across the grassland has taken about two hours and the only birds I’ve seen are meadowlarks. “Where are the grouse?” I wonder. I’d better do some more back and forth walking to cover some more of the grassland. My question is answered when a covey of about 20 grouse flush from a low spot. I pick a bird from the covey and swing my gun on it and shoot. The bird drops, and to my surprise a second bird also drops. I’ve gotten what’s called a “Scotch double” on the flush. I’m so surprised that I forget to try to pick off another bird from the rapidly disappearing covey, missing an opportunity for a rare triple (with a double-barrel shotgun) on a covey rise. 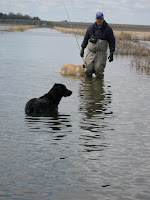 Fortunately the downed birds fall in thin cover and I retrieve them without difficulty and it’s just a ten-minute walk back to where I started the hunt. Even with the heft of the birds in the back of my vest I have a little extra bounce in my steps. It meant a long walk across the prairie, but we’d kept our appointment.